I have been struggling today with this thing called Mothering. I think as mothers we all fight a common battle. We want to be ourselves and fulfill our dreams, and at the same time, devote our entire lives to raising our children. We can mother a child and still have a life of our own...right? I don't mean that I desire to stay out late or anything like that...but I don't want to send them to college and no longer know what I am supposed to do with my time. It is such a balancing act. How many children can you give comeplete support to financially and emotionally. Both of those are critical aspects of parenting. How many can you send to college? How many can you send to dance lessons, or soccer practice? How many can you feed? How many can you fit in an affordable home comfortably? How many could you keep safe in the event of a disaster? There is so much love in your heart for your children...but you give up so much in order to raise them. I have chosen to continue working. I really do like my job. I worked hard to educate myself and teach myself some valuable skills...and I want to use them. I cannot think of any instance in which I would desire to stop working entirely. It means something to me more than just getting a paycheck. I feel blessed to be able to get up and work and be good at something. I make a difference in my working role and it gives me something I need personally. My children will learn a lot from seeing their mother work hard. I learned a lot from seeing my mother work. I was raised to be hardworking and that I could give myself any life I wanted. As long as I was willing to work hard for it. Nothing falls in your lap. Life is hard and it feels good to be able to control my destiny. I am honored to work. And yet, I feel guilty every day because I want to go to work. This balance of work and family. That offers challenges in mothering as well. I have to try to do all of the things stay at home mom's do with less time to do it. On weekends and evenings I am grocery shopping, cleaning, cooking, playing outside with kids, baking cookies with kids, doing crafts with kids, helping with projects, reading books, bathing, dressing, ironing, shopping, disciplining, tickling, praying with, teaching, coloring, nursing, cuddling, and snuggling. It means that there is really very little downtime in my life. I read my books in whatever quick bath I get a chance to take. I eat my dinner with one hand, and I type my blogs sporadically between all of the above. The other day Daddy and I had a sitter. It was pouring rain but we went out anyway. We found ourselves having a lovely time walking around Trader Joes sans children. Yes, Trader Joe's- the grocery store. That was our lovely date. It is the little things. Last night my cousin made some coffee. It smelled oh so good. I was reminded of days when I sat in a quiet house, had candles burning, coffee in hand while reading a book. Those days seem so distant. You cannot drink hot coffee near a baby. It is a rule of thumb in parenting...no hot substances around children. It is important to avoid any mishaps that could alter their well being. There is the avoidable and the unavoidable. As a parent, a lot of energy goes into protecting them from the avoidable and praying that the unavoidable doesn't occur. One mistake could alter everything. So much can happen in a split second. A moment of indifference. A moment of distraction. Mothering is a tricky business. Gone are the days of a quiet and clean house that stays that way when you leave for work. Gone are the days of sleeping past 7am. Gone are the days of not worrying about groceries or what you might eat for dinner. Gone are the days of hot coffee on the couch. Gone are the days of hour long showers. Gone are many things. Indefinitely. Perhaps one day to return, but maybe not. A friend told me once that when she needs time alone, she locks herself in the bathroom and pretends to be pooping. haha. How many times have we all done this. But here is the thing...sometimes, kids just don't care. You are sitting in your locked bathroom, on the pot, and you can hear them outside the door fiddling with the lock....and soon, as you say "please, no"...you watch the lock turn...and there they are, sitting at your feet while you sit indisposed on the toilet. Never alone. It makes me laugh. I wonder sometimes how people who do not do all these things spend their time? I truly feel overwhelmed many many times. sing with me friends- "just keep swimming, just keep swimming". have a good day fellow Mommies! You are doing a great job. Our Boy finally started school this week. The reason we waited so long was that at first I just wasn't ready, and then financially it made more sense to keep him home, and then there was the "put him on a wait list and see what happens". I had my sights set on a pre-school at a local church near my work...but for whatever reason, they called us twice for Bluebird, but Boy never made it up on the list. I wasn't going to put them in different schools, so we waited. Boy is about to turn 4 and we realized that we would need to get him in pre-school by next year, because next up is kindergarten. Call me ignorant, but Boy is my first experience with this stuff...and I guess I thought it would be easier than it was, and cheaper than it is. Pre-schools really seemed to be designed for stay-at-home mom's who are able to pick up there children at noon. If you need after school care, they are willing to rob you blind in order to offer it to you. Seriously, the most moderately priced schools would be $4-$6/hr each hour..which if you can't pick them up til 5p, then you are looking at anywhere from $15/day= $60/wk=$240/mo OVER the monthly cost of school. I know there are day cares that may be cheaper but I really wanted a school like setting. So....I search and search and search. Sent for information from some places, etc. (I know I should have done this before, but I thought after a year and a half he would get into the one I had chosen). 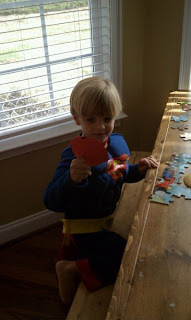 Finally, it seems Montessori would be the best option and that they would be willing to let our Boy start right away. Daddy and I went on a tour and we liked what we saw. I was not completely sold by the philosophy, but there was at least a cap on the after school care price. I was disappointed there did not seem to be more structured crafts and activities...because I am a mom who has dreams of displaying lots of refrigerator art. Well, all was set...and then Montessori threw a huge kink in my plans. They only offered 5 day a week programs, and they strongly felt that Boy would need to be half day only in order to prepare for full days in the fall. Don't get me wrong...I understand and am inclined to agree on the principle...but unfortunately, I am not a mother who has the capability to pick my child up at noon. Naturally, I felt depressed. I called my mom (who was in the car picking up my nieces from school) and I felt depressed that I was so far from any family. I felt depressed because I had to work. I felt depressed because I loved to work. Anyway...the same day I got the impossible call from Montessori, my phone also rang with a call from someone from one of the schools I had inquired about. I could not have asked for more perfect timing....I looked into the school more and I liked what I saw. I went on a tour and I liked it more. Lots of crafts. A full library where they start checking books out in K4. Chapel on Wednesdays. Music on Fridays. Spanish on Mondays. If they are good (and demonstrate the fruits of the spirit) they get a red apple and if they need some extra work, they bring home a green apple. AND, they each get a memory book at the end of each year with all the crafts and pictures and excitement through the year. Affordable. Discounts for paying all at once. And discounts for each subsequent child (which means eventually we get one in for free, haha). We went and bought him supplies: crayons, a mat with a Lightning McQueen pillow and blanket, wipes, tissues, etc. I ironed all his collared shirts and slacks and hung them in the closet. He was excited and we were ready. We let him know that if he gets a red apple, he can wear his Superman costume all evening. He was very sad when I left him and it was extremely hard for Mommy. His wonderful teacher sent me several updates throughout the day to tell me he was smiling, playing with other kids, eating all of his snack ("like he is starving") and asleep on his mat at naptime. Daddy picked him up and said he was playing on the playground by himself....which of course made Daddy and me a bit sad. On Wednesday, once again, he cried and screamed as I left. When the end of the day came...I eagerly went to pick him up....and he was intrigued reading a book when I arrived. As we left he seemed so happy. He said "bye everybody". another red apple was sent home. On the way home we got a milkshake and he talked about stories and other kids and napping on the floor and skunks. When we got home, he emptied his back pack and these items were at the bottom. I have a kleptomaniac on my hands. I wasn't sure why he chose these items? Random at best. I did the best I could think of. I told him that this was called stealing and he is never to take things from school. We put them back in his back pack. He would not be allowed to play with these things and we would take them back to school on Friday and tell our teacher we are sorry. When he mentioned his "things"...I would say "No, those are the schools things". So, on Thursday, I got another email from his teacher telling me how much progress he had made in one day. That he had fun. He was following directions. He played well with the other kids. I responded and let me know how happy I was, but that it seemed he may have swiped some toys from school. "Oh no, I should have sent a note. One of his classmates, Jake, felt sorry that Boy was sad on Monday, and he went home and gathered those things and gave them to Boy as a gift". Well, I don't even have to tell you how this made me feel. I quickly called Daddy and told him. He gathered the items and said "Did your friend Jake bring you these things as a gift?". Boy said "Yes, and I said 'Thank you Jake'". He played with those random items all day and even slept with them that night. Yes, on Friday, I ran into Jake's mother who said that Jake told her he wanted to give a present to his new friend". I can't tell you how this melts my heart. He still cried when I left him...but I know he is going to be fine. He is going to learn, develop his own interests and build his own relationships. I am so proud. So...this morning...a typical Saturday morning and then Boy responded to Daddy with a "Yes Sir". I guess you could say that so far...our experience with school is a positive experience. To any of you "smokers" out there, that comment should come as no surprise coming from me. It isn't just that they choose to inhale toxic fumes into their bodies, choose to allow their teeth and nails to discolor, their hair, clothing, cars and furniture to stink, and to be controlled by a substance that way. I can recall a family member having to walk out of my sister's wedding reception several times to smoke...addiction calls. I clearly have no tolerance for smoking. I don't understand or tolerate so-called smoke breaks. PAID breaks in which one escapes to smoke. Why don't the rest of us get fresh air breaks and take 10 minutes every few hours to do our favorite thing, be- it walking around the building, shopping, having a beer. My husband used to be a smoker...I can still see his nostrils flare and his eyes roll back as he inhales any time we walk near someone smoking. haha. But he loved me and the idea of our family, and made his decision to stop the madness. Thank goodness. I think he also got tired of having to walk out in the rain to get his fix. My Grandmother stopped when she drove all the way to town, only to find out the price had gone up yet again. She has saved quite a bit of dough since then. Florida is a no smoking in restaurant state. I remember the hoopla over it, but never gave too much thought because I get it...whoever thinks that the smoking section doesn't drift over to the non-smoking section is on crack. In SC, that law is not enforced state wide...and I always get caught off guard when they ask, smoking or non? Say what? So...you say, why do I think Smokers are "weird"??? The whole idea of "bumming a smoke". I see it all the time. Strangers. "Can I bum a smoke?" How much are cigarettes these days? They are not cheap! Would you ever "Bum" a soda, or snack from a stranger? Would you ever borrow 50 cents from a stranger? Smokers have actually found a way to make "Bumming" seem civilized! Where I work (being a cancer center and all) we have a no smoking policy and no smoking is allowed on premises. So, the people upstairs just walk across the street to smoke. A home owner across the street, who doesn't know any of them personally, felt sorry for them...and put up a little shelter and lawn chairs for them to sit in on their smoke breaks!!! Who else thinks this is crazy? Who else would set up a little smoking section in their yard for complete strangers? All I can think of is that she must be a smoker! Not many others can pull this off...so don't go smoking thinking you will come across as Johnny Depp or Ryan Gosling...because you won't! AND, trust me...choosing to smoke, it never ends well. His American Idol is ME. I like to watch American Idol. I started watching it the year I got married. I had heard of it...but thought it sounded dumb ...my husband (then fiance') said "I bet you will like this". I was like "American Idol? nah"...but quickly learned it was the modern Star Search. I always loved Star Search. So...here I am, five years later...still watching. I made it past Paula Abdul, Simon Cowell, Ellen DeGeneres, Kara Lagordia (or whatever it was)...now I watch Randy, J.Lo and Steven Tyler. I must say, I enjoy it just as much. The Man regrets ever introducing me to the show as he gets roped into recording it for me and watching it with me. man: "I watched Idol last night and man, Paula Abdul looks awful"
lady: "That wasn't Paula Abdul, that was Steven Tyler". Anyway, I was watching it last night and my sleepy boy was curled up by my side. I kept saying "Oh, she is pretty". to which he would reply "she is NOT pretty". me: "oh, she is pretty"
Boy: "She is NOT pretty"
"well Buddy, who do you think is pretty?" Be still my heart. I am raising the Boy right!